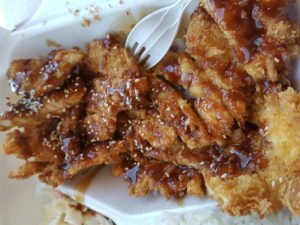 Fat Ninja Bite – The Best Chicken Katsu in the GTA! Where is Fat Ninja Bite? 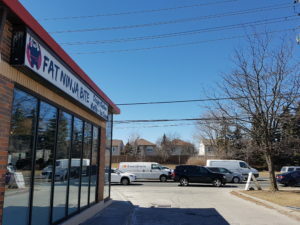 Fat Ninja Bite is located at 3517 Kennedy Road, Toronto, ON M1V 4S4. It is located in a plaza behind Esso Gas Station at the corner of Kennedy and Steeles. This is the place where you can find the BEST Chicken Katsu with rice and coleslaw or Juicy Chicken Katsu Burger! Quality food at a reasonable price! Fat Ninja Bite is a cozy small little place. There is limited seating. This is a place where you want to grab a quick bite if you want to sit down and eat. A lot of the customers order take out. 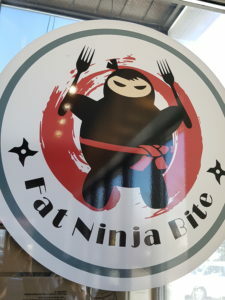 How did I find out about Fat Ninja Bite? My friend kept talking about the best chicken katsu in town. I finally have a chance to taste Fat Ninja Bite’s chicken katsu. The first time I tried it was when my friend got take out to bring to his aunts and I get to try a little piece when we deliver Fat Ninja Bite’s take out. Chicken Katsu is so tender, crispy and cooked to perfection! So delicious that I wanted more. Hence on the same day, we took my mom and went back to get a late lunch. You have a choice of dark meat or white meat when ordering the chicken cats. Dark meat is cheaper than white meat. So it depends on your preference. I personally like white meat. We ordered 2 dark meat chicken katsu and one white meat chicken katsu. The portion is so big that it will fill you up! if you are a light eater, then this meal can be shared between 2 people. 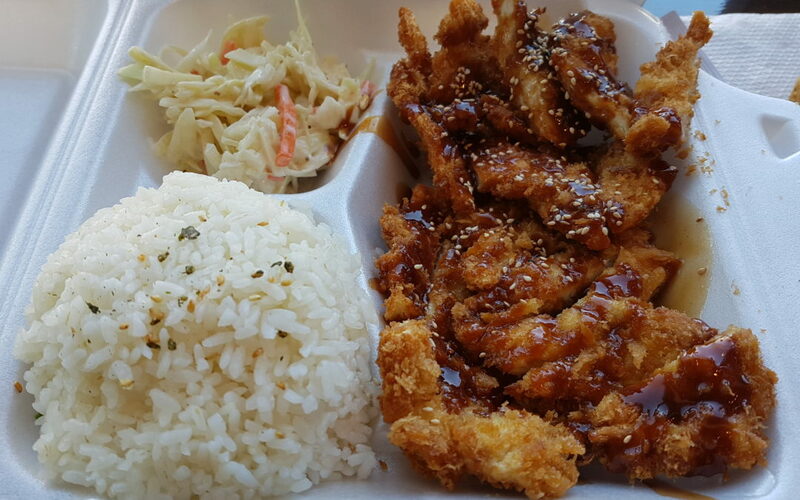 Chicken katsu comes with rice and a side coleslaw. This is how they make the chicken katsu: the chicken is breaded with home made bread crumbs fresh every morning. Then the chicken pieces are put in the fryer to make it crispy. then it was taken out and a food thermostat is used to measure the exact temperature of the chicken to ensure it is cooked yet not overcooked and comes out tender. 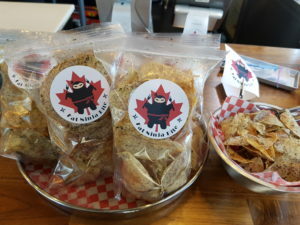 Another of Fat Ninja Bite’s specialty is their in-house Taro Chips! they have a bowl of taro chips at the counter for you to taste before you decide to purchase. The taro chips are so addictive! It only costs $2.99 for a bag of taro chips! I can go through 2 bags at one seating. This is a good snack when you watch a movie at home. All of our Katsu Burgers, Slaw and Udon are made right there when you order! Everything is so fresh and delicious! You may have to wait a few minutes but you won’t regret it! 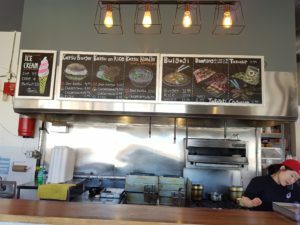 Fat Ninja Bite has 4.5 stars on Yelp with over 300 reviews! check them out on Yelp. 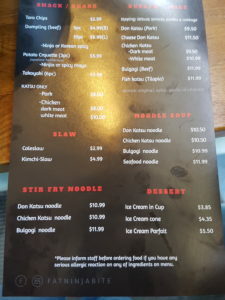 Take a drive to Fat Ninja Bite and try it out and let us know what you think!